Jeremiah Shuster moved to Australia for his first postdoctoral fellowship at The University of Queensland after receiving his PhD in 2013 from Western University, Canada. In 2016 he joined Dr Frank Reith’s research group as a postdoctoral researcher through The University of Adelaide. Jeremiah’s research primarily focuses on the fundamental understanding of how bacteria contribute to the biogeochemical cycling of gold and how gold is mobile within natural environments. 2013 Ph.D. in Geology, Department of Earth Sciences, Western University, London, Canada. 2016 – present Postdoctoral Research Fellow in the School of Biological Sciences, University of Adelaide, Adelaide, Australia. 2013 – 2016 Postdoctoral Research Fellow in the School of Earth Sciences, University of Queensland, St. Lucia, Australia. Jeremiah’s research involves field-based acquisition of biological and geological samples and carrying out laboratory-based experiments. His experience in developing various bioreactors enables him to study biogeochemical dissolution and re-precipitation processes of minerals such as gold. 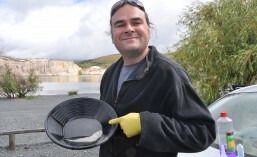 As a geomicrobiologist, he specialises in high-resolution Scanning and Transmission Electron Microscopy (SEM and TEM) along with various micro-analytical techniques including: Energy Dispersive Spectroscopy (EDS), synchrotron-based X-ray Fluorescence Microscopy (XFM), X-ray Absorption Near-Edge Spectroscopy (XANES) and X-ray Absorption Fine Structure (XAFS). In addition to gold biogeochemistry, his research interests include the interpretation of modern and ancient Earth environments from the preservation of microfossils within the rock record. By analysing structural-functional relationship of microbe-mineral interactions from both in situ and experimental samples, he strives to reveal how the lithosphere is able to support life. Shuster, J. (2016) From bio-slime to precious metals. Australian Microscopy & Microanalysis Research Facility NEWS. 32, 1. Shuster, J., Lengke, M., Márquez-Zavalía, M.F. & Southam, G. (2016) Floating gold grains and nanophase particles produced from the biogeochemical weathering of a gold-bearing ore. Economic Geology. 111, 1485 – 1494. Levett, A., Gagen, E., Shuster, J. Rintoul, L., Tobin, M., Vongsvivut, J., Bambery, K., Vasconcelos, P. & Southam, G. (2016) Evidence of biogeochemical processes in iron duricrust formation. Journal of South American Earth Sciences, 71, 131 – 142. Zammit, C.M., Shuster, J., Gagen, E.J. & Southam, G. (2015) The geomicrobiology of supergene metal deposits. Elements, 11, 337 – 342. Shuster, J. & Southam, G. (2015) The in-vitro “growth” of gold grains. Geology, 43, 79 – 82. Shuster, J., Johnston, C.W., Magarvey, N.A., Gordon, R.A., Keith, B., Banerjee, N. & Southam, G. (2015) Structural and chemical characterization of placer gold grains: Implications for bacterial contributions to grain formation. Geomicrobiology Journal, 32, 158 – 169. Shuster, J., Bolin, T., MacLean, L.C.W. & Southam, G. (2014) The effect of iron-oxidising bacteria on the stability of gold (I) thiosulphate complex. Chemical Geology, 376, 52 – 60. Stephen, A., Adebusuyi, A., Baldygin, A., Shuster, J., Southam, G., Budwill, K., Nobes, D.S. & Mitra, S.K. (2014) Bioconversion of coal: New insights from a core flooding study. Royal Society of Chemistry Advances, 4, 22779 – 22791. Nahar, Q., Fleißer, F., Shuster, J., Morawitz, M., Halfpap, C., Stefan, M., Langbein, U., Southam, G. & Mittler, S. (2014) Waveguide evanescent field scattering microscopy: Bacterial biofilms and their sterilization response via UV irradiation. Journal of Biophotonics, 7, 542 – 551. Shuster, J., Marsden, S., MacLean, L.C.W., Ball, J., Bolin, T. & Southam, G. (2013) The immobilization of gold from Au(III) chloride by a halophilic sulphate-reducing bacterial consortium. Geological Society Special Publications, 393, 2.1 – 2.15. Johnston, C.W., Wyatt, M.A., Li, X., Ibrahim, A., Shuster, J., Southam, G. & Magarvey, N.A. (2013) Gold biomineralization by a metalophore from a gold-associated microbe. Nature Chemical Biology, 9, 241 – 243. Preston, L.J., Shuster, J., Fernandez-Remolar, D., Banerjee, N.R., Osinski, G.R. & Southam, G. (2011) The preservation and identification of filamentous bacteria and biomolecules within iron oxide deposits at Rio Tinto, Spain. Geobiology, 9, 233 – 249.